Waking Justice - Jeffrey Nall, Ph.D. This series of talks, which can also be fitted to workshop or lecture-dialogue formats, addresses the overlooked social and political implications of our individual thoughts, values, beliefs and day-to-day behavior and interactions. Titles/descriptions below. 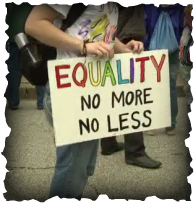 In this talk Dr. Nall seeks to bring clarity to the confusion around the idea of “equality” and the belief that all are “equal.” In addition to explaining the concept in ways he believes most should be able to agree upon, he further calls upon progressives to more meaningfully engage not simply the facts but also exploration and application of moral principles. 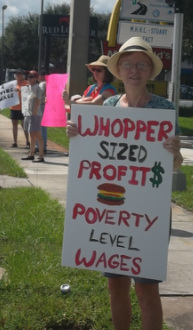 Solidarity rally, Jensen Beach, Fl 2013. How much do fast-food workers make? How much do they deserve? Does someone without a college degree deserve more than minimum wage? How do low-wages impact taxpayers? And how does fast food pay impact women and children? In this talk Dr. Nall will answer these questions along with others. He explains that much of what we assume about fast food workers is wrong. Beyond assessing the often mistaken factual claims about workers, Nall discusses the key ethical questions surrounding the debate. He shares a variety of arguments that explain why workers in a variety of low-pay sectors including fast-food, retail, and adjunct teaching are entitled to higher wages. Moreover, Nall explains how consumers of all political stripes contribute to the dominant “common sense” that routinely justifies the exploitation of workers in the retail and food service industries. 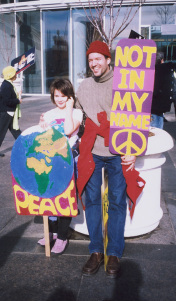 Drawing on his experience as an activist, public lecturer, professor, and father and friend Dr. Nall contends that many people of various ages and education levels respond to mounting injustices and ecological crisis with fatalistic resignation and cynical defeatism. In this talk Dr. Nall addresses the flawed basis of an attitude he believes is not only counterproductive to social change but also dehumanizing. Nall begins with a critical assessment of fatalism, and then identifies and dispatches with the disempowering and fallacious arguments for indolence including the wholesale change or waste of time argument: “If I can’t succeed in bringing about wholesale or sweeping change, then my efforts would be wasted,” and the In it Together or Forget It argument: Moral action is only worthwhile/significant when it is likely to enjoy a level of support that will provoke immediate, broadly supported change. Finally, and most importantly, Nall contends that this irrationally pessimistic line of thought fails to account for the way in which our moral commitments are about much more than achieving particular “end results” or “victories”; they are core components of our self-identity and define us as individuals, too. Articulating a virtue ethics approach to social change, Nall contends those offering the fatalist excuse and the wholesale change or a waste of time argument have too narrowly conceived of their life project. The question is not simply, is change possible, or is wholesale societal change possible? An important and too often overlooked question is what kind of person do you wish to be? And to what are you ultimately committed to? Drawing on his and his wife's experience, Jeffrey Nall explains why homeschooling befits those who embrace democratic values including civic responsibility, ethical living, and creative and critical thinking. Drawing on his recently published book, Feminism and the Mastery of Women and Childbirth (Academica 2014), Dr. Nall discusses how everyday attitudes, speech and thought concerning women’s pregnancy/birth foster sexism. Mainstream media and political discourse rarely discuss America’s poor. When the poor are the subject of discussion, they are often spoken for and about rather than spoken to or listened to. In this talk Dr. Nall argues that dominant culture implements a variety of conceptual weapons including stereotyping to justify the subjugation and exploitation of the poor. Dr. Nall suggests that in addition to addressing questions of political processes and institutions it is equally imperative that we begin to critically interrogate our thinking about the poor. This is important because many well-intentioned people possess background beliefs about the poor that perpetuate their oppression. Social Change through Chocolate and Coffee! Americans love chocolate and coffee. 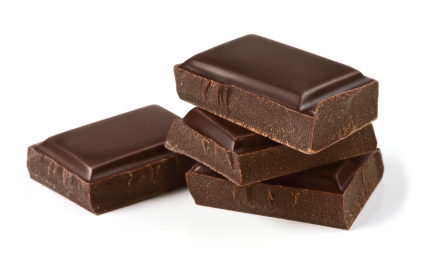 It turns out that chocolate and coffee are not only delicious to consume, they're also good for you in a number of ways. While our purchases improve our alertness or provide us with flavonoids that reduce our risk of cardiovascular disease, they are also fostering demand for products significantly tainted by slave labor and some of the worst examples of exploitation. In this talk Dr. Nall discusses the little known evidence that much of the chocolate and coffee are improving our health while simultaneously jeopardizing the freedom and lives of hundreds of thousands around the world including many children. The good news is that consumers have the power to participate in fostering measurable change. Beyond the bad news, Dr. Nall enlightens audiences about the fair trade movement and how everyday living can foster meaningful social change. Feminist thought and action stands not only to benefit women and girl's lives, but also men and boy's lives. So contends Dr. Nall in this talk that seeks to introduce audiences to the relevance of feminist theory to the lives of everyday men. Feminists reject the notion that men are biologically destined to lives devoted to detachment and destruction. Rather, feminists contend that such a story of masculinity, be it told by theologians, philosophers, or scientists, is purposed to maintain a status-quo that readies boys for lives in armies of corporate profiteers; that it perpetuates the “man-eat-man” mentality that underlies consumerism and the objectification of human beings; and, on the whole, furthers a society premised on interaction between one egoist self to another. Dr. Nall explains the way in which feminist thinkers contend their philosophical and political movement possesses the insights capable of changing the consciousness of the men upon whom our hopes for peace and justice so significantly depend upon. There is a tendency to dismiss the political, philosophical, spiritual significance of fantasies. But fantasies are rarely merely our own creations; they often reflect our society and what it expects of us. So argues Dr. Nall in a talk that takes a serious look at how adults and children present themselves during Halloween. In particular, boys and men dress up as powerful, often violent characters, and girls and women dress up as objects of beauty. In this talk Dr. Nall deconstructs common costuming rituals of Halloween, showing the pervasiveness of the sexual objectification of not only adult women but also girls, something that often goes without notice. Nall also shows that boys and men, too, are negatively impacted by the social demand for males to see themselves as violence objects. All is not lost, however, as Nall discusses how some are counteracting these dehumanizing gender stereotypes by infusing fun, forethought and creativity into their costuming practices.